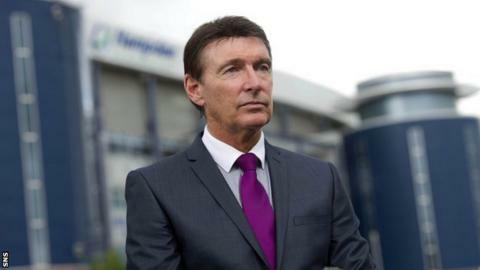 Former Rangers director of football Gordon Smith has backed his old club to once again challenge Celtic for silverware. It is a year to the day since Rangers, who are now in Division Three, entered administration. "If they get back up, with the crowds and the finance, Rangers can get the type of player that can compete with Celtic," he told BBC Scotland. "It's a case of getting the right team together." With the current Scottish Premier League and Scottish Football League set-up, or the one being proposed for next season, the earliest Rangers will be playing in Scotland's top tier is season 2015/16. that showed their debt has been reduced to £0.13m. If Neil Lennon's side continue to dominate the SPL and can reach the Champions League group stages, their bank balance will continue to improve, enabling them to further strengthen their squad, should they choose to do so. But Smith, who played for Rangers from 1977-80, dismissed the idea that it could take up to a decade to win the SPL title. "I don't think it will be that long. I think they can challenge a lot quicker than that," he said. "I think Celtic are strong just now but they can be competed against. "They are losing games in the Scottish league, teams are beating them." Smith was one of the first members of staff at Ibrox to lose his job when the club was put into administration exactly a year ago. He said that despite having learned from the club owner Craig Whyte that it could happen because of a potential tax liability from the so-called 'big tax case', when the news broke it still took him by surprise. "It was a shock," he added. "I had spoken to Craig Whyte on a couple of occasions about the administration. "He said it was a possibility, depending on the 'big tax case' [which , though Her Majesty's Revenue & Customs is appealing that decision]. "That's why it was a big shock to everyone when it happened, because the big tax case hadn't been decided. "HMRC applied first to put the club put into administration and he then approached [administrators] Duff and Phelps and got that put through." Smith paid tribute to the Rangers fans who have turned up in great numbers to watch the team play in the Third Division. He told BBC Radio Scotland: "There is a great potential there and the fantastic thing is, I believe, the support of the fans has made it all happen. "The major factor is that they have continued to turn up. "Ally McCoist was the figurehead of the club and that had a big part to play in it [Rangers' revival]. "[Rangers chief executive] Charles Green and he worked together to revive the club and get it going. "It is ironic that it was Valentine's Day that it had happened. It was the fans' love for Rangers that kept that club going."